One of the biggest questions we've had from our users is how to activate my CodeFluent Entities or CodeFluent Entities Ultimate license. Once you've installed CodeFluent Entities one your computer, you'll be able to create or open your first project. 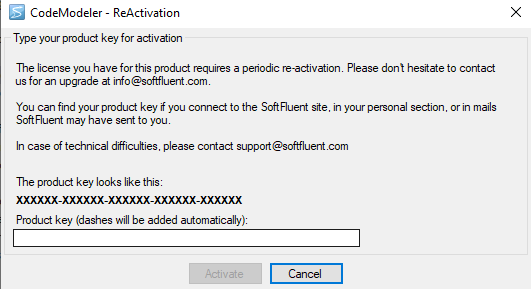 First and if the product isn't already activated, an activation wizard will be prompt. You just need to enter the key from your account. Your products keys are visible on the "My Products" page on our website. Activation happens quickly in the background without you having to do more things. Your computer needs only to be connected to the internet.